PICKAWAY COUNTY – Nine months ago the viral video swept across the country of a Sergeant from the little village of New Holland claimed he was fired trying to do his due diligence. In July of 2018 Sgt. 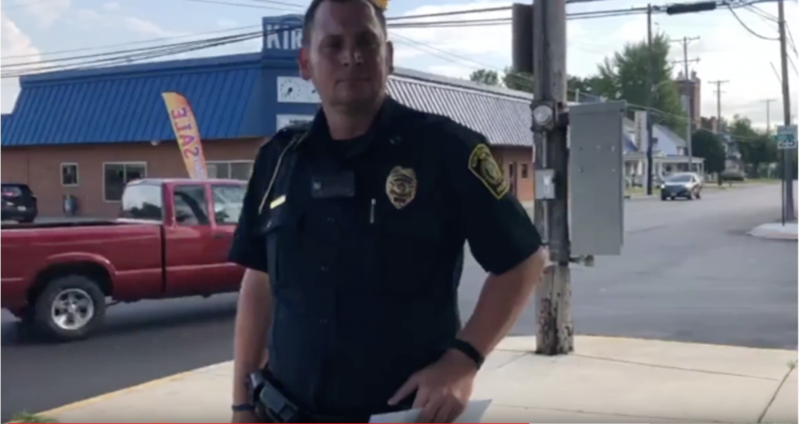 Brad Mick showed up at a council meeting and served the mayor of New Holland Clair “Butch” Betzko and then-intern police Chief David Conrad paperwork in the form of charges against them in a investigation that Sgt. Mick had conducted. Sgt. Mick was fired that same night directly after serving the charges. This exclusive video shows the entire situation and a interview with Mick. “As I wrote in my affidavits, there is probable cause of criminal violations and I carried out my oath of office by investigating them. As a result, evidence was obtained that supported the complaint and charges were filed. I started this process and I will see it through to the end. My termination does not undo the criminal acts by others and it will not erase evidence or dismiss the charges. While it is disheartening and a violation of the law to be retaliated against and terminated for obeying the oath of office, it does not stop here. This is about the law and the law will be carried out. What is right is right, and what is wrong is wrong. It doesn’t matter who you are. No title or office should shield you with immunity,” said Sgt. Brad Mick. 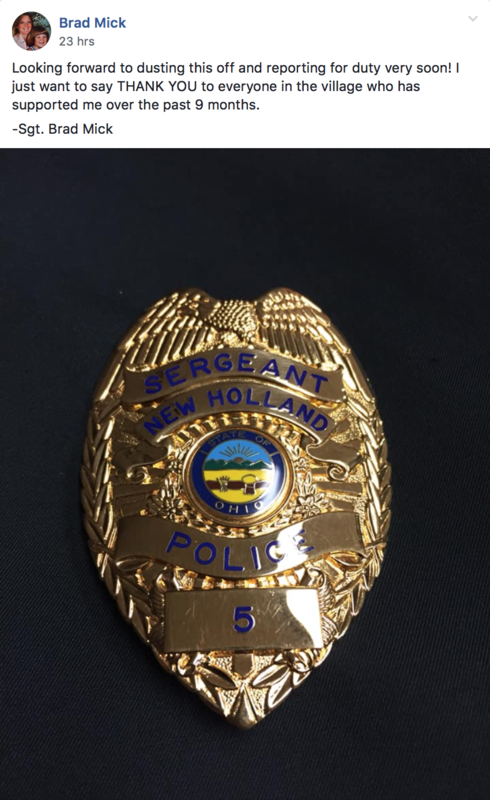 What New Holland didn’t know is that before Sgt. Mick filed the charges against his Chief and the Mayor he filed whistleblower paperwork to protect him against retrubution. Knece made the judgment order regardless of actions on either side that Sgt. Mick would be given his job back and paid back pay for the 9 month he was wrongfully terminated. The charges of forgery and obstructing justice that were charged against the Mayor and Former Chef Lawless by Sgt. Mick were dismissed late last year. Other charges have also came to a head against former Chiefs of police Chief Lawless and Chief David Conrad have also been processed through Pickaway County Court. Ex-Chief Lawless was found not guilty for trespass by a jury and Ex-Chief David Conrad pled “no Contest” and was fined a 25 dollar fine.